Skipper Ben Brown hopes Sussex are building momentum at just the right time as they chase promotion in the Specsavers County Championship. Sussex held their nerve at Cheltenham on Thursday to claim their second successive Division Two win, beating Gloucestershire by 28 runs and their first success at the College Ground since 2005. It lifted them into third place, 13 points behind Kent who trail leaders Warwickshire by 11 points. It’s a quick turnaround for Brown’s men who take on Glamorgan at Hove on Sunday with the pink ball in use and a 2pm start on all four days. The day-nighter will present its own challenges but Brown is just happy to go into the game on the back of two good results, even though he believes there is more to come from his team. He said: “Throughout the game there were times when we felt the game was getting away from us. But the fightback late on day two was outstanding. “We perhaps didn’t play our best cricket over the four days but we did show a lot of character, especially the bowlers. We stayed in it and worked hard and eventually we got our rewards. 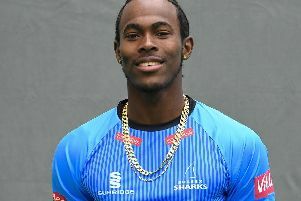 With Jofra Archer (eight) and Ollie Robinson (six) sharing 14 wickets against Gloucestershire, Brown will have two in-form seamers ready to exploit any favourable conditions in the day-nighter. He added: “It’s the pink ball under lights so we’ll have to get our heads around that because those games can have some extraordinary passages of play at times so the key is being adaptable to the conditions. Amid the celebrations it went largely un-noticed that Brown took six catches in Gloucestershire’s second innings. He did the same thing against Middlesex in 2012 and is only the third Sussex wicketkeeper to achieve the feat more than once.